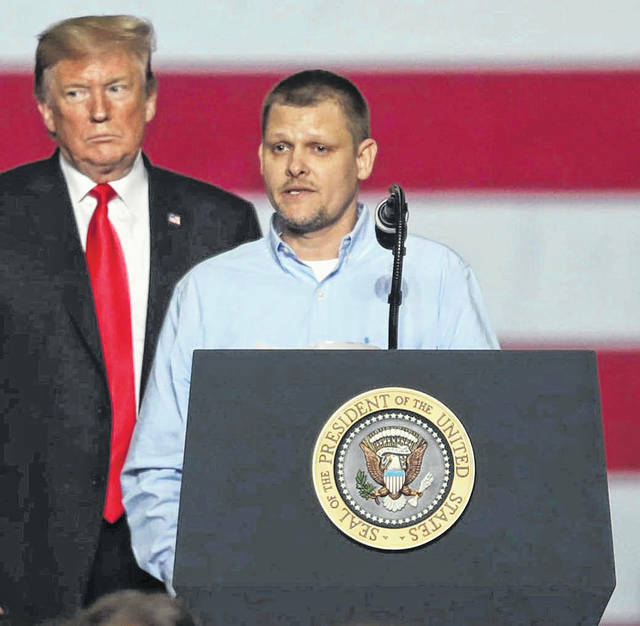 Richard Baldwin, an employee of the Joint Systems Manufacturing Center, talks about his experiences while President Donald Trump gives the crowd a thumbs up Wednesday. 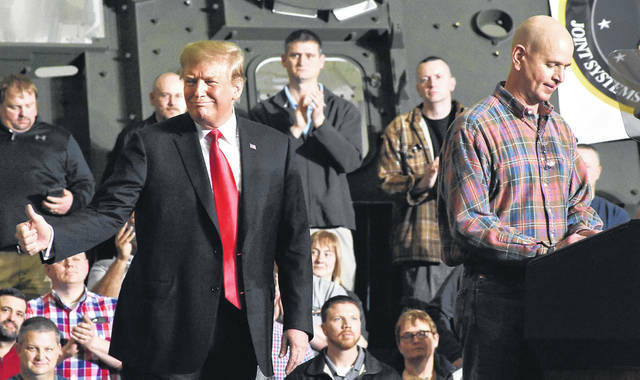 President Donald Trump stands with Adam Stahler, a quality systems engineer, as he speaks to the crowd of employees and other selected officials after his tour of the Joint Systems Manufacturing Center on Wednesday evening. See more coverage of President Trump’s visit to Lima at LimaOhio.com/tag/TrumpLima. LIMA — Richard Baldwin described Donald Trump’s election as an act of God. He was on stage to thank the president for defense spending policies that helped keep the Joint Systems Manufacturing Center open, but he thought it was more. “It is my personal opinion that God was looking after our country when you were elected,” said Baldwin, a boiling operator and U.S. Army veteran currently employed at the Joint Systems Manufacturing Center. Baldwin’s remarks received the most applause of any – including those from President Donald Trump himself – shared during the president’s visit to Lima on Wednesday. He and fellow JSMC employee Adam Stahler were invited on stage with Trump to thank the president for visiting Lima. “Mr. President, thank you for everything you have done,” he said. Trump stood behind Baldwin and Stahler as each offered thanks to his administration. “I have witnessed the highs and the lows the economy has had on this facility and the region,” said Stahler, a quality engineer with JSMC for 10 years. “I’m proud that this administration recognizes the importance and the value we provide to the war” effort. Stahler briefly spoke of his son, who is stationed with the 3rd Armored Cavalry unit in Fort Hood, Texas, where he maintains Stryker personal carriers made here in Lima. “My son thanks you, and for that I thank you,” he told the president. Trump thanked Baldwin and Stahler — “You couldn’t do better than that, right?” — before declaring “every single one of you is a patriot,” a reference to the JSMC’s workforce, one-third of which are veterans. This entry was tagged 2019, President Trump's visit to Lima on March 20. Bookmark the permalink.